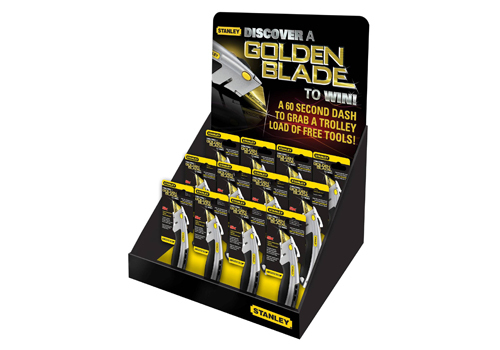 Stanley has announced a unique 'Golden Blade' competition, which will award five people with the chance to take home as many free Stanley tools as they can fit into a trolley within one minute. 150,000 special promotional packs of the Stanley Instant Change Knife with five Blades will be available during November and December. However, just five of these packs will contain a golden blade denoting a winning pack. Similar to the golden ticket featured in the iconic story of Charlie & the Chocolate Factory, the five golden blade owners will be invited to the Stanley Black & Decker distribution centre in Northampton for a 60-second trolley dash, where they will be able to grab as much free product as they can manage in the allocated time. The Golden Blade competition will run from 1 November-31 December, 2013 and will be highlighted via point of sale displays at key retail outlets, direct mail and extensive promotion on the official Stanley UK website and all relevant social media.